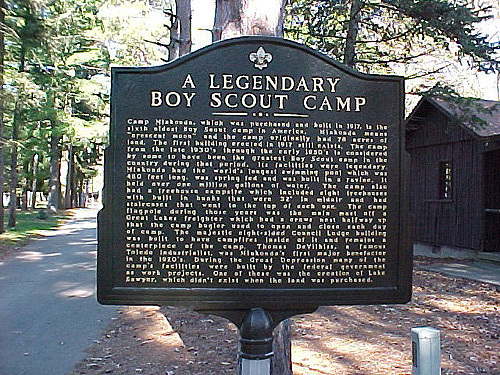 Camp Miakonda, which was purchased and built in 1917, is the sixth oldest Boy Scout camp in America. Miakonda means "crescent moon" and the camp originally had 78 acres of land. The first building erected in 1917 still exists. The camp from the late 1930's through the early 1950's is considered by some to have been the greatest Boy Scout camp in the country during that period. Its facilities were legendary. Miakonda had the world's longest swimming pool, which was 480 feet long, was spring fed and was built in a ravine. It held over one million gallons of water. The camp also had a tree house campsite, which included eight treehouses with built in bunks that were 32' in midair and had staircases that went to the top of each one. The camp flagpole during those years was the main mast off a Great Lakes freighter, which had a crows nest halfway up that the camp bugler used to open and close each day of camp. The majestic eight-sided Council Lodge building was built to have campfires inside of it and remains a centerpiece of the camp. Thomas DeVilbiss, a famous Toledo industrialist, was Miakonda's first major benefactor in the 1920's. During the Great Depression many of the camp's facilities were built by the federal government as work projects. One of these was the creation of Lake Sawyer, which didn't exist when the land was purchased. 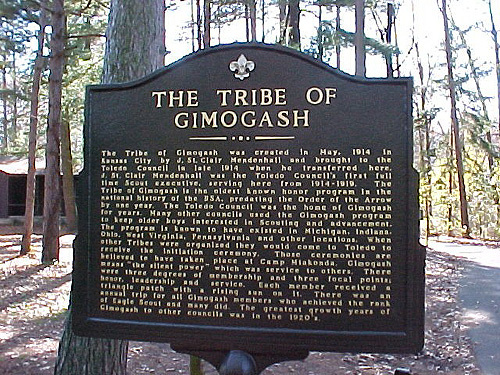 The Tribe of Gimogash was created in May 1914 in Kansas City by J. St. Clair Mendenhall and brought to the Toledo Council in late 1914 when he transferred here. J. St. Clair Mendenhall was the Toledo Council's first full time Scout executive, serving here from 1914-1919. The Tribe of Gimogash is the oldest known honor program in the national history of the BSA, predating the Order of the Arrow by one year. The Toledo Council was the home of Gimogash for years. Many other councils used the Gimogash program to keep older boys interested in Scouting and advancement. The program is known to have existed in Michigan, Indiana, Ohio, West Virginia, Pennsylvania and other locations. When other Tribes were organized they would come to Toledo to receive the initiation ceremony. Those ceremonies are believed to have taken place at Camp Miakonda. Gimogash means "the silent power" which was service to others. There were three degrees of membership and three focal points; honor, leadership and service. Each member received a triangle patch with a rising sun on it. There was an annual trip for all Gimogash members who achieved the rank of Eagle Scout and many did. The greatest growth years of Gimogash to other councils was in the 1920's. This is close up of the Scout logo on the marker. The marker company hired a local artist to handpaint it on both sides. The colors are the same as what was on a BSA oval jewelry pin from the 1917 era which is the same year that the camp was started. The marker was created by Sewah Studios in Marietta Ohio who is the premier maker of historical markers in the country. This particular one is 33" high and 43" wide and has a different text on each side. It is cast aluminum and costs about $2,000.00 depending on transportation costs. The marker itself is about 1" thick and probably weighs no more than 50-75 pounds. The Scout logo and letters are cast into it with the logo hand painted by an artist. The logo colors were based on a 1917 Scout jewelry pin. The lettering is gold leaf. Sewah markers are found in all fifty states and several foreign countries.